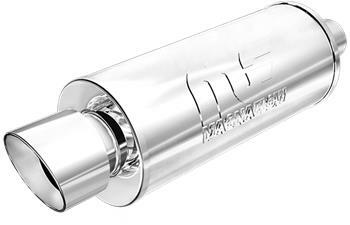 MagnaFlow Universal Muffler with Tips - Street Series UNIVERSAL - Dezod Motorsports Inc - Home of the automotive performance enthusiast since 2002. The MagnaFlow Street Series features a high flow tuning tube, balanced to the needs of the high revving performance engine. The Street Series emits a smooth, deep tone while offering improved performance over OEM equipment. MagnaFlow Street Series Mufflers are designed for those seeking increased performance and better economy, balanced with interior and exterior noise levels.